After more than a decade of development in the most demanding mine site situations, the Pakka Jacks lifting system is world class engineering. The mining industry is a world of extremes. 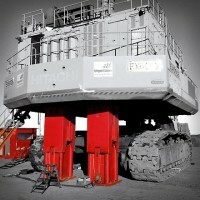 Immense machines, harsh conditions, huge safety concerns and downtime costs measured in thousands of dollars per hour. The Pakka Jacks lifting system was created in this extreme context, to meet all these challenges. Pakka Jacks units function as both lifts AND certified stands. This is the central, patented feature that puts the system in a class of its own. There are, however, many other extraordinary features that have been developed to create a complete package. This list of features only tells part of the story. To get the full story, contact us now. This is where the magic begins. Pakka Jacks perform two critical roles; lifting and supporting. The patented automatic mechanical packing mechanism is the key to this incredible combination. At every point in the lifting operation, the load is supported. Failure of any component will result in a maximum drop of 1/4 inch. This simple fact has enormous implications for site work, given that it is illegal (and dangerous) to work under suspended loads. Each Pakka Jacks unit has four packing mechanisms, allowing for three units to be taken out of commission under load. Each unit also has capacity for secondary hydraulic input in the case of primary hydraulic pump failure. The load is fully supported at every point of the lifting operation, this has huge implications for site safety and project cost and duration. From 165 Tons to 2200 Tons, the Pakka Jacks lifting systems offer a huge range of capabilities across a broad spectrum of applications. The Pakka Jacks lift units are self-contained, with all lifting hydraulics and packing mechanisms packaged in a solid, compact casing with excellent intrinsic stability. Certified lifting lugs, control input points and secondary hydraulic input points complete the general description of the lifting units. The system is controlled from a fully enclosed, air-conditioned control console. Each work-site application, over the last decade, has been approached individually, with each new project documented. This has resulted in a comprehensive library of engineering specifications for use of the Pakka Jacks system with over 80% of all major machines used in Australian open-cut mines. Large loads are handled by the 2200 Ton and 1320 Ton systems. Each system comprises four lifting units and the control console. 2200 Ton: 4 x 550 Ton units. UNIT SPECS: 71 inch stroke, 18 Ton weight. Dimensions: 47 x 87 x 108 inches (unextended). 1320 Ton: 4 x 330 Ton units. UNIT SPECS: 49 inch stroke, 5 Ton weight. Dimensions: 47 x 47 x 85 inches (unextended). 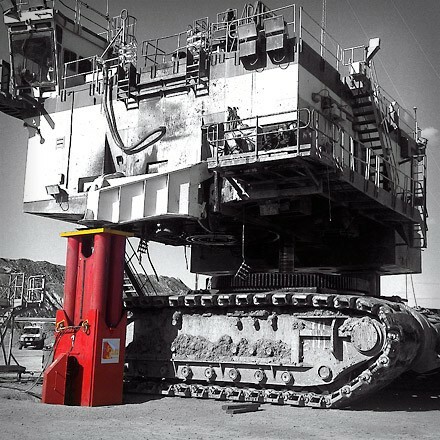 The 1320 Ton lifting system comprises 4 x 330 Ton units, one of which is pictured above. The Pakka Jacks system meets or exceeds the requirements of all relevant Australian standards and workplace regulations. 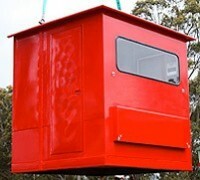 It is, in fact, the only lifting system in the country that meets current Workcover regulations. The Pakka Jacks system is the only Workcover approved self-supporting jacking system in Australia. Full Touch Screen auto PLC control, or full manual control is managed from the air conditioned cabin. Having the controls for all lifts centralized in one console, which can be physically located to optimize visibility of the work site, provides enormous safety and efficiency benefits. Control lines, both electronic and hydraulic, are laid out to each lift unit and lifts using integrated sensors built in to each unit. The entire control system can be connected via a secure online connection to a remote control unit for diagnostics, analysis and training. A control cabin being lowered into position. 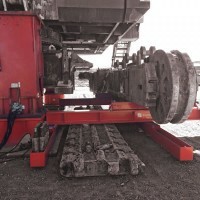 The Pakka Jacks Track Frame Change Out System had been designed to extract the track frame parallel to the machine. Alignment is precise, allowing fast, easy removal and refit - whilst providing massive benefits in worker safety. The system is set up prior to taking a machine offline, then teams up with our lifitng units for unmatched safety and speed. A final benefit is the abilty to have multiple work fronts in operation concurrently, enabling simultaneous engine change out, track frame work, undercarriage repairs etc. The Pakka Jacks lift units are specifically designed to withstand side-loads, and are third-party certified to Australian Standards. 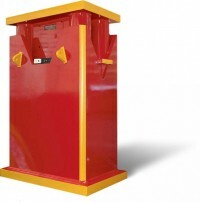 The design of the lift unit, particularly the casing, provides excellent side-loading capacity. This increases confidence on-site, helping to protect against influences like blasting, unstable ground conditions and wind blasts. Outstanding side-load rating provides another level of confidence on the work-site. Full diagnostic inspection audits are easier than you ever imagined. Automatic audits can be performed, under load, in fifteen minutes. Inspection audits are essential for safety and efficiency. The problem is that these audits can take significant amounts of time and labor, and are usually done as infrequently as is legal or practical. The automatic inspection audits incorporated into the Pakka Jacks system are just one more incredible feature that makes this a highly commercial, game-changing product. When inspection audits are this quick and easy, it means they are done far more often, bringing immediate improvement in safety and efficiency. Each machine, and mine site, requires some engineering analysis to determine the optimal application of the Pakka Jacks system. Fortunately, a lot of this work has already been done. Over the past decade, detailed specs and plans have been drawn up to provide engineering guidance on using the Pakka Jacks system. Our library now covers more than 80% of the open cut machines used across Australia, and it is increasing all the time. Specs include things like lift placement, base preparation, Gantt charts and plans for additional lifting supports where required. This lifting system has been the subject of continuous research and development, for over a decade, in some of the toughest mine environments on earth. Of course there are more features. The Pakka Jacks system design has responded, over time, to hundreds of on-site requirements. There are a huge list of features, many of which are quite subtle, which all contribute to making this system extraordinarily capable and flexible. The best way to understand how Pakka Jacks could revolutionize your mine operations, is to talk to us. Tell us what you need and we’ll tell you more about the features that will help lift your game.